No matter how rough and chipped your collected rocks start out, they'll inevitably become smooth if they remain under moving water for several years. They look store-bought when smoothed and can be painted or varnished. 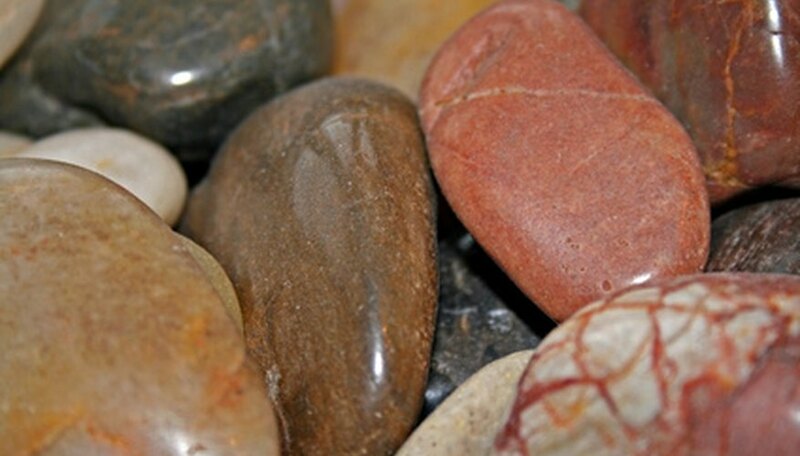 Small-sized river rocks can be polished in a rock tumbler, while larger rocks must be varnished or shellacked to make them shiny. Separate the rocks you want to polish by size. River rocks you have collected must be washed with soap and water and scrubbed with a brush. An old toothbrush is excellent for this step. Dry the rocks with paper towels. Place the rocks to be polished in the barrel of the tumbler. Use the abrasive grit first, then the fine grit followed by the pre-polish grit. Adding the rock polish is the last step. Run the tumbler for the required amount of time with each step as stated in the tumbler instructions. Do not polish rocks that are larger than 1 1/2 inches in the barrel of a small electric tumbler. Larger rocks must be done by hand. Clean and dry the larger rocks. Spread them on two or three sheets of newspaper on a work surface, preferably one that is outside or in a well-ventilated space. Spray all surfaces of the larger rocks with the spray varnish or lacquer. Once the top sides have dried, spray the bottoms if you like. Add a second coat once the first one has dried. Using polyurethanes, such as the gloss finish that hardware stores sell, help further protect your collection by preventing scratches. Finish sprays will not work as well as liquids. How Do I Polish Garnets?